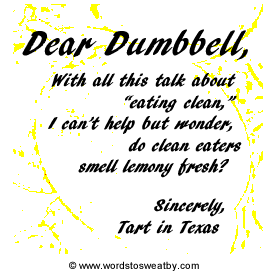 Dear Dumbbell: Do Clean Eaters Smell Lemony-Fresh? While I cannot confirm that a lemon scent hangs in the air when someone who “eats clean” walks past, I do know having a yard with a lemon tree is ideal for those who follow a clean eating lifestyle. How else would you start each day with a glass of lemon water? Add to that the clean eating lemon chicken, clean eating lemon smoothies, and for dessert, clean eating lemon bars and you’d better have a super-fresh stash hidden away because those green moldy spots certainly can’t be considered “clean,” you know? Next post: One Racer’s Road To The Leadville 100 MTB.